Want to know reason behind Sun tan? We all had brown lines or uneven colors that we wish we could wash. But getting rid of a tan is difficult. A tan is your body's attempt to protect itself from the harmful UV rays of the sun. 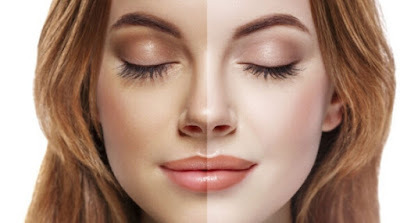 Melanin is the chemical responsible for darkening or tanning of the skin. Your skin releases melanin under the surface layers of your skin to help absorb UV radiation. The more exposure you have to UV rays from the sun or a tanning bed, the more melanin your body releases, and the darker your skin gets. So what are the remedies to this dilemma? Simple, read our 10 Best Remedies to Remove Sun Tan Immediately. Take a slice of lemon and rub on your tanned skin. Just keep it for some 10-15 minutes before washing it off. Mix 1 tablespoon of each of the three ingredients in a bowl and apply it generously on your tanned skin. Mash up about half a cup of papaya with one-tablespoon honey. Apply on tanned areas and let it be for 30 minutes before using cold water to wash it off. Take three tablespoons of buttermilk and add 2 tablespoons of oatmeal. Massage it onto the tanned areas by using circular movements. Mix up 1 tablespoon of each ingredient and slather the paste that’s formed on tanned areas. Let it be for 30 minutes before washing off with water. Thoroughly mix coconut water with 1 tablespoon sandalwood powder and apply on tanned areas. Keep it for a few minutes then wash off. Smash 5 strawberries in 2 tablespoons of milk cream. Apply it generously on tanned areas and give it 30 minutes before you wash it off. Make a juice from 1 medium sized potato and mix it with 1 tablespoon lemon juice. Apply, leave on for half an hour and wash it off. Mix the pulp of a pineapple with about one tablespoon honey. Apply it on tanned areas generously. Mix one tablespoon of orange juice in yogurt and apply to tanned areas. Leave it on for 30 minutes before rinsing it off with water. The best way to get rid of tanning is to properly protect your skin against UV rays. When it is too late for hats and sunscreen, there are some treatments that may help reduce the appearance of tan. Make sure you have immediate test treatments on your inner-forearm twice a day for at least two or three days to check for a reaction before applying it anywhere else. Always use treatments as directed. Stop using any product or home remedy immediately if it starts to bite or burn, unless advised by your doctor to continue. Thank you for sharing amazing tips!